Our daughter nicknamed the cabin The Treehouse when she was a little girl. Everyone who has spent time at the Tidwell Treehouse has had an unforgettable experience and vows to return. 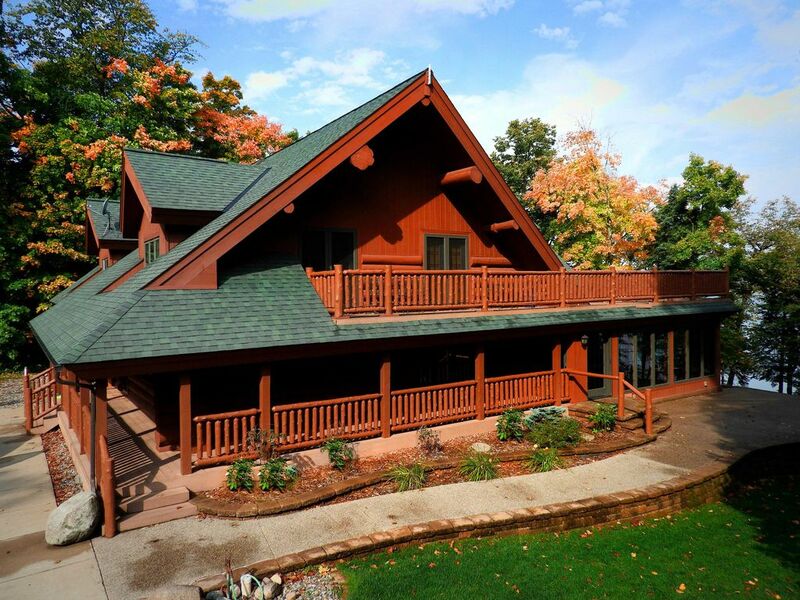 Located on Boy Lake with stunning views of the lake and the best sunsets you can get. Fishing off the dock is great and summer makes for plenty of fun on the water. This is a place that has something to offer for everyone. Great for family getaways as well as romantic retreats. Family friendly with lots of toys for young ones, 2 pack and plays and high chairs. The basement has a media room, set up with satellite tv, a bar, ping pong table, poker table and air hockey. We have a large terraced firepit area overlooking the lake, great for S'MORES! The main house has 4 bedrooms. Each room has a king size bed, as well as one room with a pull-out sofa bed. There are 3 full bathrooms in the house, with the master en-suite having a jacuzzi bath. The Master en-suite is the shared bathroom on the main level of the house with access from the landing, as well as access from the master bedroom. The other 2 bathrooms are located on the main level of the house, and one in the basement. The Granny Flat has a small lounge area with pull-out bedding, a bathroom with shower, and a King Size Futon. This traditional log home was originally built in 1992 by the Van Dovers. We purchased it in 2012. We have had some wonderful vacations at the Treehouse and hope that you will make lasting memories as we have. Jesse grew up in Minnesota and has a large extended family there. He had close friends with another cabin on Boy Lake when he grew up and visited regularly. Boy Lake has always been close to his heart. The property is on the lake shore with clear views from the home. There is 300 feet of shoreline and a nice swimming area adjacent to the 60-ft dock. Beautiful and spacious kitchen with gas stove, oven, large fridge and lots of workspace. Main Dining Table seats 6. Kitchen Counter seats 5. Dinette Area seats 4. Additional table in tiled porch that seats 8. Absolutely beautiful! The lake is quiet, peaceful and lovely. Loved hearing the loons every morning! The Tidwell treehouse cabin was amazing! Every room in the house was decorated beautifully, very inviting and comfortable. There were 13 of us, and we all had our own space. The granny flat was very warm and a little stuffy, even with the air conditioning. So we all slept in the main house which worked out very well for us. The kitchen was well supplied with everything we needed to prepare our meals. A joy to be together with family as we all like to cook! The deck outside overlooking the lake was a peaceful place to have a cup of morning coffee. Almost every evening we took the pontoon out on the quiet lake to enjoy the breathtaking sunsets, and listen to the loons. The fire pit was also a great place for us to enjoy family time and s’mores. Wonderful family vacation! Thank you for taking the time to write a review. Happy to hear you had a lovely time at the cabin! Hope to see you back some day. We were thrilled with our week at Treetops! We were a party of 9 with 2 grandkids ages 3 and 4. There were so many things to do to keep us all busy. The bikes, balls and all the toys exceeded our expectations. This is the BEST house to play "sardines" in! On our bad weather day, it was wonderful to have the lower level where we could hang out. The kitchen had every gadget we needed, and there were plenty of places to dine or play games/cards. Thank you, Tidwells, for a most wonderful family summer vacation! Another GREAT year at the Tidwell Treehouse! Jim and Sue W.Elysian, Mn. This was our third year at Tidwell Treehouse. The weather was great this year allowing us to spend lots of time on the lake swimming, fishing, water sports, and kayaking. One of our great joys as a family of 21 is being able to dine together. The large, well stocked kitchen and two dining rooms allowed us to do this. The yard is well kept, and has plenty of room for our yard games. The quick response from the Manager and Liza when we had questions was appreciated. We very much enjoyed our time at Tidwell Treehouse and look forward to returning next year! Cleo Swanson Family- Hastings, Mn. Jim and Sue Williams Family-Elysian, Mn. Tom and Diane Freppert Family- Hastings, Mn. Mark and Joanie Donisi Family- Palm Harbor, Fla. The property is beautiful and spacious, as the description reads. The lake was good to us this year with good fishing, and great weather. Sunset at The Tidwell Treehouse is exception. This is the third year we have been able to enjoy the property, and have been able to utilize every corner of the house for our needs. The kids have commented that they really enjoy indoors and well as outdoors for games, leisure events, watching the lake, campfires, movies, and just enjoying our time together. Every need has been thought out and provided to us to make our stay enjoyable. The owners are very caring, and have worked with us to accommodate our needs during our family vacation. Liza is great to work with, responds quickly to any questions we may have, and has made us feel at home with her exceptional customer service attitude. It has been a pleasure to stay at the Treehouse and enjoy our annual family outing. Our family gathered for a reunion at the Tidwell Treehouse for a week in July. There were 10 adults and 13 children including three infants in our group! We found the lake home to be very accommodating for a group our size and it had every amenity that you can think of, even high chairs and pack and plays and toys for the children. The kitchen was so well stocked for all kinds of cooking and baking. There were plenty of bedrooms and sleeping areas. We enjoyed the movie theater in the lower level on two occasions when it rained. Overall the weather was fabulous and was great for many outdoor activities including sitting by the fire pit and eating s'mores, for boating and fishing, and for the children to simply play and to fish off the dock. We are so glad that we rented the pontoon that was available on site as we went out on it everyday and the kids were able to tube behind it. We brought extra paper products and towels with us but that was unnecessary as they provided plenty of these items. We loved having all the bath towels and beach towels needed plus more! We did bring our own propane gas grill as the lake home had a Weber charcoal grill. The granny flat was awesome for one of our families with four young children. I would suggest a second room air conditioner in the bedroom of the granny flat as that area did not cool off as well as the first room. The yard and flower beds were beautiful and well cared. We hired a local professional photographer to take our family's picture which will be a wonderful keepsake for a very memorable week at the Tidwell Treehouse. Jason, the property manager, was very accessible and helpful. It was awesome to get to know Liza, the homeowner, via email and she responded quickly to any questions or requests. Thanks, Liza and Jesse, for making your beautiful lake home available. We would definitely recommend this property! So happy to hear that your family had a great time at The Treehouse. Thank you for taking the time to write such an amazing and detailed review. We aircon in the granny flat is new, so it is good to know it doesn't cool the entire apartment. We hope we get to welcome your family back some day. Another great week at the Tidwell Treehouse! This was our second year at the beautiful Tidwell Treehouse. We are a 4 generation family, ages 3 to 84. There is plenty for all to do, or not to do. Accommodations are superb! Liza and Jesse were very receptive to our first year suggestions. The air conditioning in the granny flat and access to the pontoon are wonderful additions! - Weather was wonderful - warm days, cool nights. Thank you, Liza and Jesse, for sharing your beautiful home with us. We are already looking forward to next year! Only a pleasure to welcome you back to The Treehouse! Happy to hear the aircon made your trip more comfortable. The lake is beautiful for kayaking (especially over sunrise and sunset) and skiing. We do not have available equipment for outdoor activities. Tianna Country Club for golfing is about 25 miles away, close to Walker. Remer is about a 20 minute drive and offers similar things at Longville, but is smaller. Walker is about a 40-minute drive and is a larger town with all the facilities and services you would need.